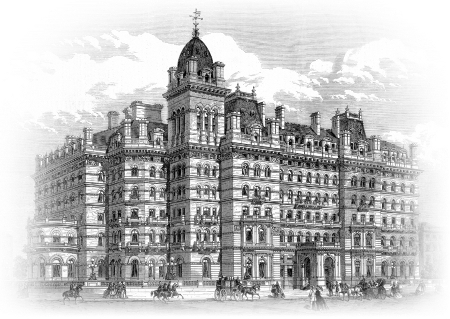 The Langham, London has been enchanting guests since 1865, when it opened as Europe’s first ‘Grand Hotel’. From the outset, The Langham boasted an unrivalled location at the top of elegant Regent Street, London’s premier shopping destination. This is still true today as the hotel enjoys an enviable address in the heart of the West End, with the luxury stores of Bond Street, the unique boutiques of Marylebone Village, London’s famous theatre district and cultural attractions on its doorstep. The exquisitely appointed guestrooms and suites are classically styled evoking a warm residential feel and guests are indulged with intuitive service that bears the hallmarks of the hotel’s rich heritage than spans three centuries. Palm Court, the hotel’s historic and sparkling centrepiece, is famed as the birthplace of the afternoon tea tradition, a ritual that continues each afternoon, and as day turns to night, cocktails and dinner is served each evening, accompanied by live Jazz on selected nights. Artesian is a glamorous bar designed by the acclaimed late David Collins and is a social hub for chic Londoners. The award winning head mixology conjures up classic and innovative cocktails receiving the accolade of ‘World’s Best Bar’ for two consecutive years. In partnership with culinary icons father and son Albert and Michel Roux, Roux at the Landau restaurant sees Roux protégé and Chef Chris King create classically-constructed dishes using the finest seasonal ingredients with a contemporary style of presentation. Chuan Spa is a haven of tranquillity and is London’s first luxury hotel spa to incorporate the ancient principles of Traditional Chinese Medicine into its signature treatments, ambience and décor designed to relax, revive and rejuvenate body and soul. The Langham has strong historical connections to the literary world. Many of the famous authors who resided in the surrounding artist quarter of Fitzrovia, Marylebone and Bloomsbury have regularly frequented the hotel. The hotel played an important part in the creation of Conan Doyle’s most famous character. A dinner held at The Langham on 30 August 1889 between Conan Doyle, Oscar Wilde and a literary publisher resulted in Wilde writing The Picture of Dorian Gray and Conan Doyle The Sign of Four in which Holmes made his second appearance, and so the famous series of Sherlock Holmes mysteries was born. Steeped in literary heritage, The Langham, London is the perfect venue for the staging of The Hotel Plays.